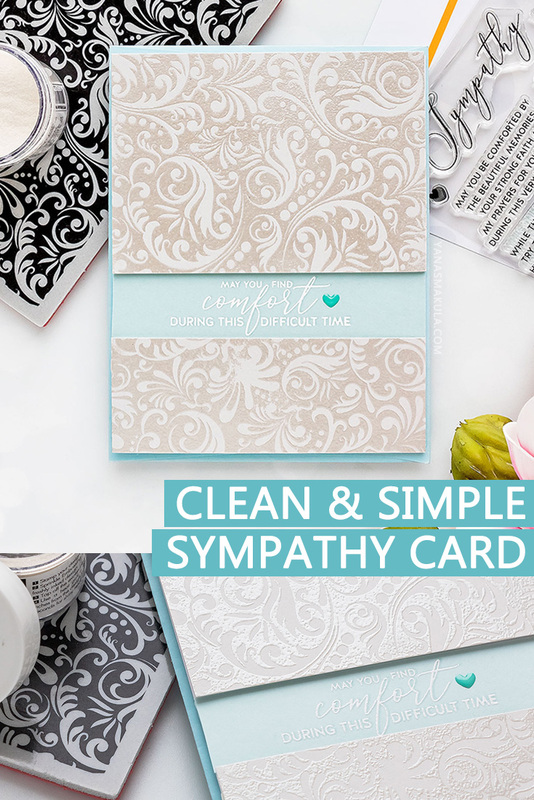 Sympathy cards are not something you ever want to give or make, but sometimes you just have to. Today I have an example of a very simple sympathy card you can make if needed. Thankfully, I wasn’t needing one, I made it for just in case. 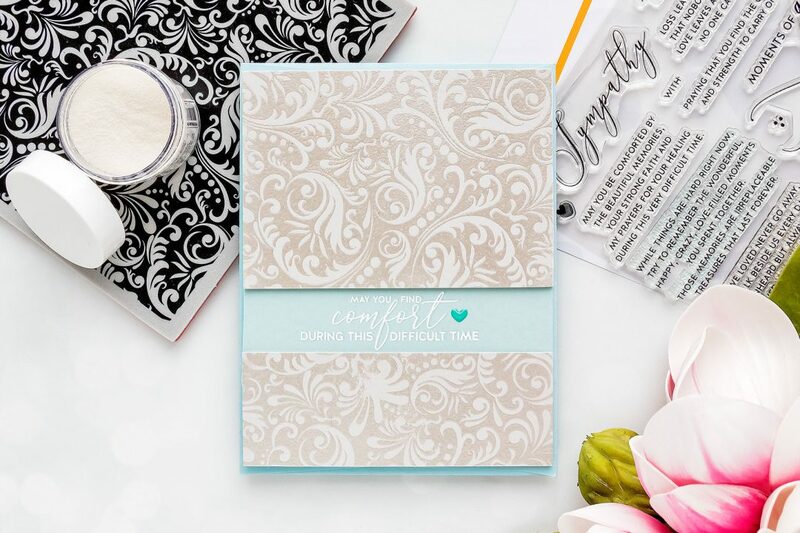 Simon Says Stamp recently released a beautiful stamp set filled with meaningful sentiments one can use on the outside as well as on the inside of a sympathy card called “Moments of Grace“. If you have to give a sympathy card to someone you know or don’t know very well, the sentiments in this set will help you say the right words. I went with a “May You Find Comfort During this Difficult Time” sentiment. I white heat embossed it using detail white embossing powder on Simon Says Stamp Sea Glass Cardstock. If you look closely, you might notice a faint shade darker shadow to the sentiment. I achieved this look by stamping the message the 2nd time in same watermark embossing ink for a watermark look and offsetting it a smidge. It’s hard to see it, but it add a nice touch to this card. I kept this card very simple and also easy to make. I heat embossed a beautiful Damask background in Hero Arts White Satin Pearl embossing powder on Fog cardstock by Simon Says Stamp. 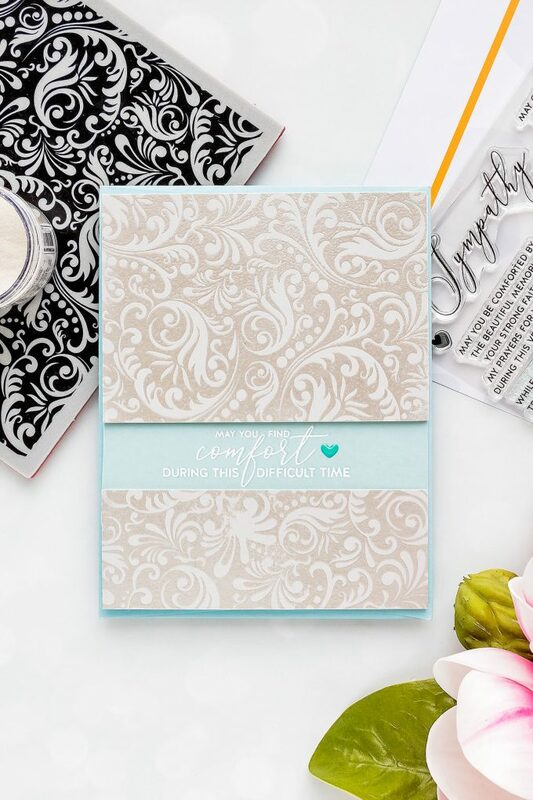 This embossing powder created one of a kind satin finish and added some subtle pearlescent sparkle. Very beautiful in real life. 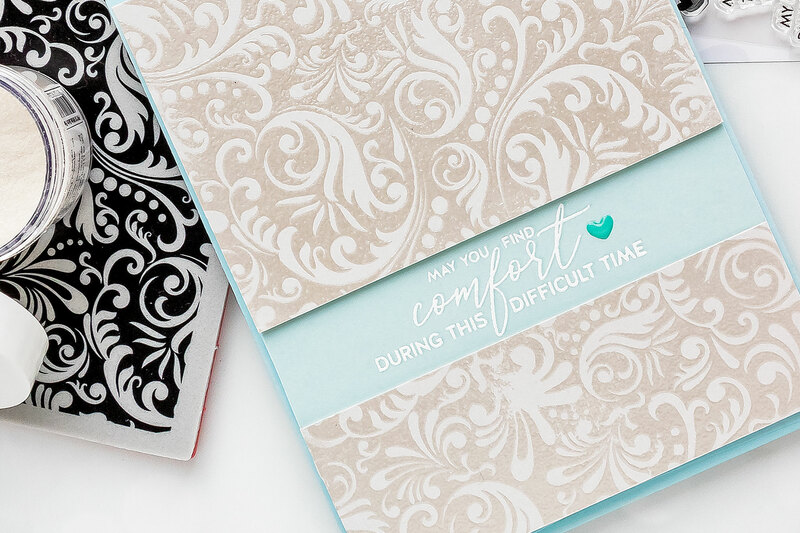 I split my heat embossed panel in two and included a sentiment panel in between. 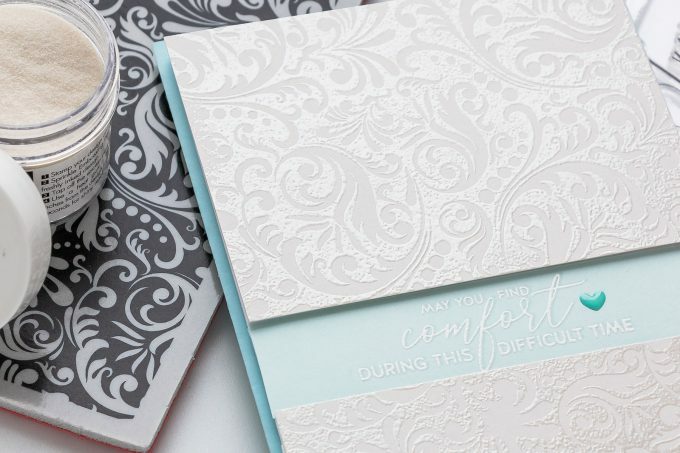 The sentiment panel has been adhered directly onto the card base and embossed panels have been foam mounted. The sentiment looks like it is recessed in the card. While things are hard right now, try to remember the wonderful, happy, crazy, love-filled moments you spend together. Those moments are irreplaceable treasures that last forever. I hope you won’t have to make a sympathy card as these are always the hardest. love how elegant this looks!! This is so elegant Yana and the sentiment for the inside is lovely as well. The colours you chose for this card are so pretty. Very nice job. The older I (and my friends) get the more sympathy cards I need to make. The colors you’ve used are soft and peaceful. Perfect for a sympathy card … as are the sentiments in this stamp set. Thanks, Yana. Elegant. 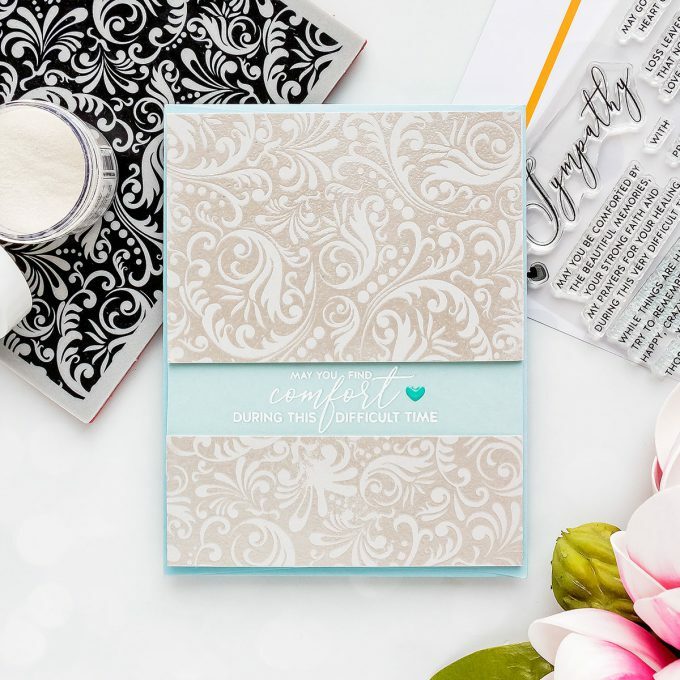 At some point, we all need sympathy cards. Thank you for such a simple and elegant card. Elegant, lovely card. I just received this stamp set. It has an abundance of beautiful sentiments. And Simon’s Damask background stamp is so perfect. Very beautiful, Moments of Grace is one of my favorite new stamp sets.